Pull the leaves off of the cauliflower and put in your compost bucket 🙂 . Next, core the cauliflower. Chop up the core into smaller pieces. 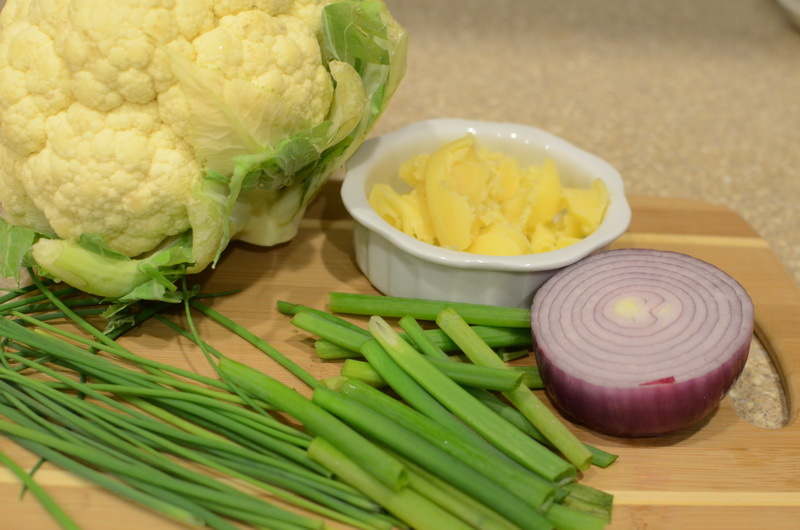 Chop up the rest of the cauliflower and save about 1 cup and set aside. Melt half of the ghee in a pan on med-low. Toss in green onions and red onions. Saute’ for about 4 minutes. In a medium pot, pour in chicken broth and turn on med-high. Add in cauliflower and chopped core. Add in sauteed onions. Turn heat to medium-low and cover pot. After about 15 minutes, turn down to simmer. 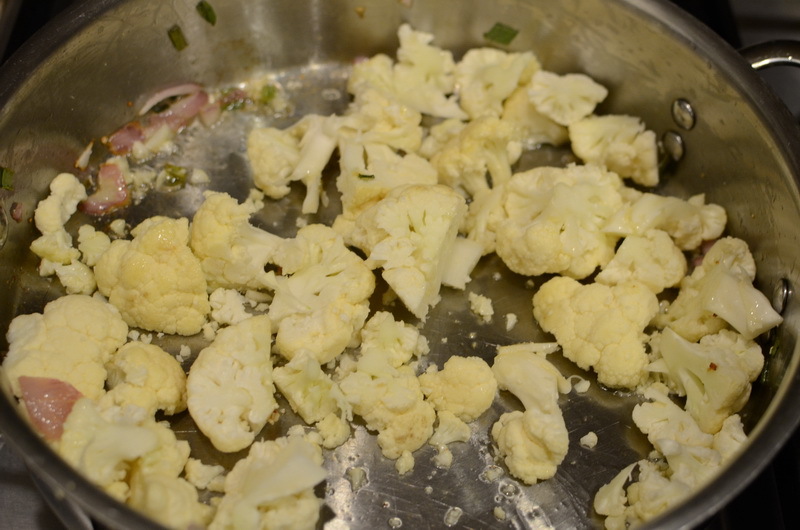 Add the rest of the ghee to the pan and add in the remaining 1 cup of cauliflower. Saute’ for about 5 minutes or so and then remove from heat. 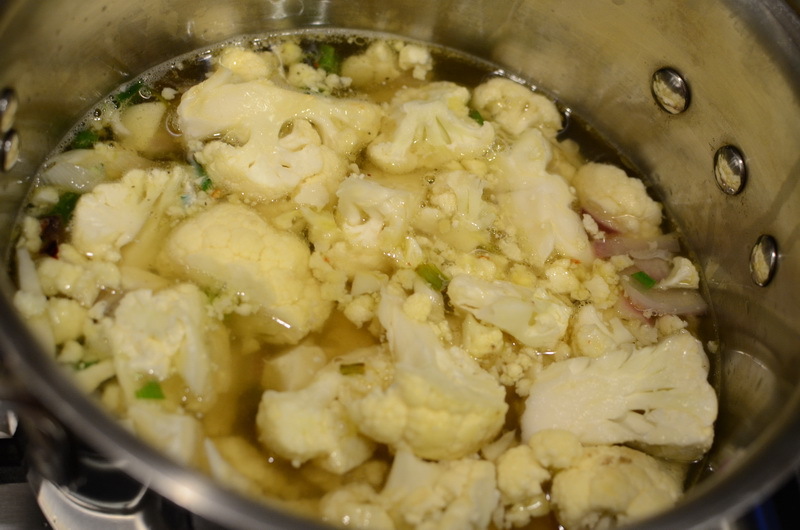 Once cauliflower is softened, pour the soup into a blender. I highly recommend a VitaMix as it is worth every penny for what you get out of it. Add in salt and pepper. Process the soup until it looks soupy! Pour back into the saucepan, keeping temperature around medium. 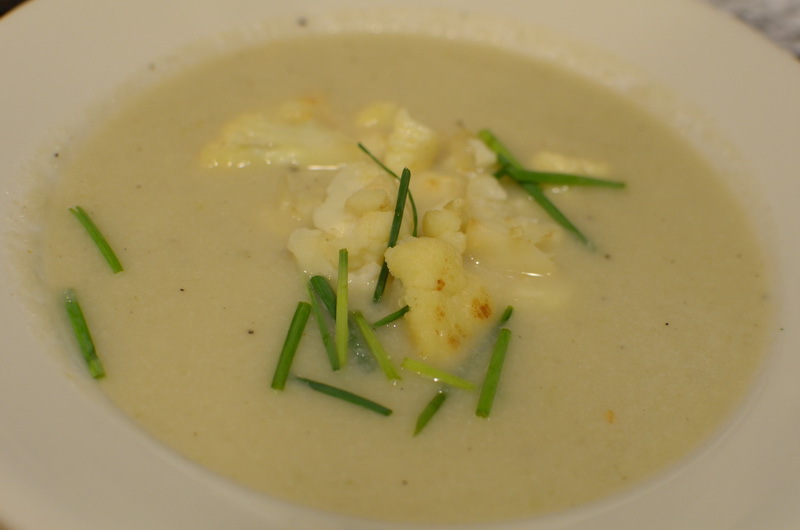 Serve with chopped chives and sauteed cauliflower on top. Cauliflower is amazingly versatile. It can be riced, mashed, made into a crust, and made into something creamy like this soup. This recipe is easy to get creative with by adding in some leeks or carrots for example. You could use water instead of chicken broth for this recipe, but since I make my own broth and find it more flavorful, I used that instead of water. You can also use 2 cups of each. Pull the leaves off of the cauliflower and put in your compost bucket :-). Next, core the cauliflower. Chop up the core into smaller pieces. Chop up the rest of the cauliflower and save about 1 cup and set aside.